This Bible study in Colossians 3 will help you become more Christ-like in your relationships with friends, family, and others. It’s not easy, getting into the Word when your house is full of little ones who need you twenty-four hours a day. The Busy Mamas studies offer special encouragement and help to moms who need the nourishment of God’s Word in their demanding lives. These short studies will help you slow down and really study the Bible, even if you can only study for a few minutes at a time. Scripture quotations are from the ESV Bible translation, but the study may be completed using any Bible translation you choose. Get the Kindle eBook from Amazon's Kindle store. 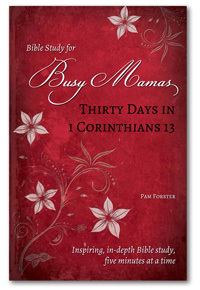 You can also get this book with the Busy Mamas Bible Study Kit. Great for gifts, or for getting started on your own personal Bible study! I am continually blessed through the Doorpost products. I love these Busy Mama Series. 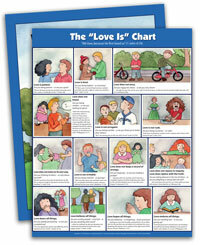 I use them with my own children and just ordered the Psalm 37 softcover for a friend with young children. Thank you Forster family for your dedication to sharing God's word with us. This is a wonderful study. It will encourage you in God's Word in well prepared daily instruction. I highly recommend. It is great to use with your little ones too. Our family has been using Doorpost products for many years with all of our children; they are all fantastic and true to God's Word. Highly Recommended in Every Way! I have loved studying Colossians 3 using this book! Anyone with a tight schedule, or little ones around, will benefit from these bite sized studies. I have definitely been encouraged and transformed from the inside out by the time I completed these pages! The tone of the book is super friendly and easy to read, and the way that Pam unfolds this life-changing chapter of Colossians, is exciting, clear, and logical. One of the most wonderful aspects of going through this study, is not only that it equips, convicts, and challenges the reader, but it also actually teaches you how to study the Bible for yourself. Pam beautifully explains and demonstrates how to use beneficial tools and techniques in learning how to study any chapter of the Word independently. I have developed such an incredible hunger for doing just that through this resource. Not only have I benefitted greatly by going through this book myself, but it was so delightful and eye-opening that I didn’t hesitate to take our three eldest children, aged 11, 8, and 5 through it too. They have loved every page of it! I honestly can’t remember seeing them as excited about the Bible, and experiencing it coming alive in the way that they have since beginning Pam’s book. Going through this book was one of the most precious periods that I have spent with the Lord in studying His Word in a long time! I highly recommend it in every way! 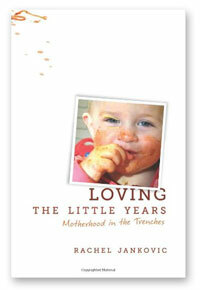 Superb Study for Busy Mamas! Filled with numerous tips, helps and guides on getting into the Word on a daily basis, this book takes you on an in-depth journey through the third chapter of Colossians for 30 days. You get to know this chapter so well through inductive Bible study that the words become etched in your mind and on your heart in just five to 10 minutes a day, even less on some days. What I love most about this book, about this study, is it’s simplicity. You can go at your pace using the guide she has provided. The study is designed to be completed in 30 days and it can be done in 30 consecutive days or you can you could extend some of the days to complete your assignments as your busy season of life allows. The guide provides six days of study with one catch-up day, which also includes an optional assignment if you have the extra time. Some days, you’ll need more than the allotted time, as I found when I participated in this study last fall, but there will be time to catch up or finish your lesson. Personal application questions allow you to not only study what the Bible says but put these verses into action and be a doer of the Word. Thanks Pam for a great study guide! 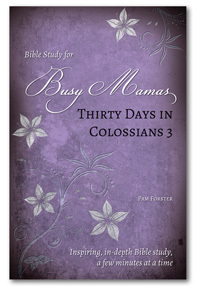 I enjoyed walking through Colossians 3 during the month of November with Doorposts. Each day is just enough of a bite size to fit into a mama's day. Reading through Colossians 3 so many times in the month brought it to memory throughout the day. Focusing on who Christ is, What to Do, Contrasts, Time, and the If/Thens - helped to give my mind something to dwell on during the day, straight from the word. I enjoyed the make up day to use to catch up or do a bit of extra work. For days I had more time I enjoyed writing lists of what we were learning and sharing it with my family. My only complaint in November was trying to get the days in order - so this book fulfills that request! I will be encouraging my friends to use this study for both personal and small group studies!